When Canadians ask me what to do when they visit Israel, I tell them that the possibilities are endless, as there is so much to do and see and something for everyone to enjoy. Here are some of my favourite spots. The North: Tiberias, located on the western shore of the Sea of Galilee, across from the Golan Heights, is a tremendous outdoor destination for the whole family. The city, and the Galilee region, are home to religious sites for Jews, Christians and Muslims, notably the Mount of Beatitudes and Capernaum in the Galilee, as well as the Church of the Annunciation and the White Mosque in Nazareth. The Dead Sea: 138 kilometres south of Tiberias on the Jordan River, you will find the lowest place on Earth — the Dead Sea. 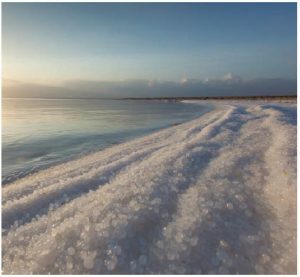 The sea is a popular tourist destination, where you can float while bathing with salt and minerals that are believed to provide excellent health and healing properties. Before you go in, rub the famous mineral-rich mud all over, and don’t forget to snap a photo. Masada: While at the Dead Sea, you don’t want to miss another popular tourist spot — Masada, the ancient fortress. A UNESCO World Heritage Site, this is one of the great archeological excavations in the world. 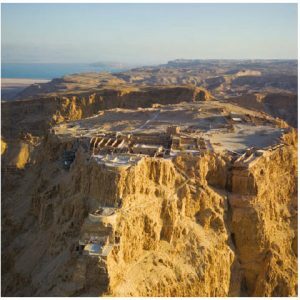 Jewish King Herod built Masada in 30 BC, as the last stronghold of Jewish rebels during the time of Roman conquest. The summit of Masada is reachable by two hiking trails or by cable car. Don’t miss it. The Negev Desert: Further south, you’ll reach the Negev Desert. On top of the sprawling landscape and archeological sites in this desert, you may be surprised to encounter fields and greenhouses. Here Israel’s first prime minister, David Ben Gurion, who built his home in the area, accomplished his goal of “making the desert bloom.” In the Negev, you can visit Be’er Sheva, a modern city that dates back to biblical times. Beyond Be’er Sheva, you’ll reach the town of Mitzpe Ramon, the home of Makhtesh Ramon, the largest erosion crater on Earth. The crater measures 40 kilometres and is Israel’s largest national park. Eilat: All of these Negev sites are en route to Eilat, a resort town at the very southern tip of the country. 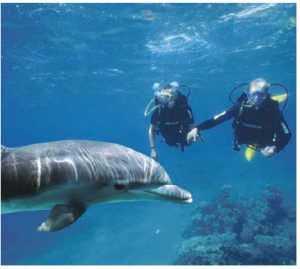 There is plenty of fun and adventure in Eilat, from scuba diving in the Red Sea, to an underwater aquarium, to beaches, mountains and watersports. Israel’s Mediterranean coastline features hundreds of kilometres of natural beauty, historical wonders and world-renowned beaches. Starting from its most northern point in Rosh Hanikra, the coast is easily accessible by train or bus. Let’s begin, working our way from north to south. Acre: No tour of Acre is complete without a visit to its Old City, a UNESCO World Heritage Site. From the Byzantines to the Crusaders and the Ottomans, Acre is a city built by conquest. Nowhere in the old city is this more evident than through a tour of its main attraction, the citadel. An Ottoman fortification, the Citadel was built on the foundations of the Knight’s Hospitaller Fortress. Visitors can walk through the halls, courtyards and streets dating back to the Crusader period. Beneath the fortress, visitors can walk through the Templar tunnels that once connected the fortress to the port. In the city’s market by the port, enjoy a fresh cup of coffee by the sea, alongside locals and other tourists. Cascading down the mountain are the Baha’i Gardens, a must-see on your coastal tour, and dubbed a UNESCO World Heritage Site in 2008. 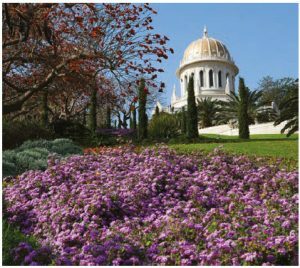 The gardens are not only one of the most frequented attractions in Israel, but also one of the holiest sites in the Baha’i faith. Atop the Gardens’ complex, a stunning symmetry of well-kept hedges, flowerbeds and water fountains catch the eye. At the foot of the gardens is a popular neighbourhood in Haifa, the German Colony. It’s a perfect place to break for lunch, enjoy a beverage or go shopping. Established by German Templars in the late 1860s, a short walk around the neighbourhood’s now-refurbished homes is an experience on its own. Caesarea: Just south of Haifa, you can visit the ancient port town of Caesarea, a breathtaking archeological masterpiece on display at the Caesarea National Park. The ruins tell the story of what was the largest port in the Roman Empire. Upon entry, an ancient bathhouse, reconstructed frescos and a remarkably preserved Hippodrome are all within metres of the sea. At the southern edge of the park is the Roman Amphitheater, which today plays host to summer concerts and celebrations. The port region, around which the Crusaders built their city, is a lively entertainment area where ancient buildings house modern cafés and restaurants, as well as galleries displaying Israeli art. Tel Aviv-Jaffa: The rumours are true. Tel Aviv, Israel’s cultural hub, never sleeps. 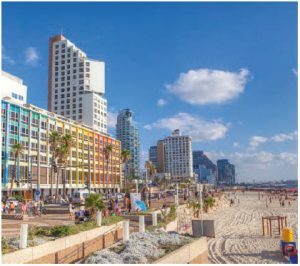 Nicknamed the White City after its UNESCO-recognized Bauhaus architecture, Tel Aviv is world-renowned for its beaches and nightlife, but offers so much more than that. Rent a bike or take a walk down the city’s main artery, Rothschild Boulevard, and feel Israel’s heartbeat of innovation and entrepreneurship, called home by no fewer than 900 startups. You can also make a stop inside Independence Hall and visit the room where David Ben-Gurion signed Israel’s Declaration of Independence. Rothschild Boulevard is home to countless bars and restaurants, and after business hours is when the party really starts, continuing to the surrounding neighbourhoods, including Florentin and the south. Tel Aviv is also home to old and new markets. In the Carmel Market, which is the largest, merchants sell everything from spices to fruit, clothing to electronics. Meanwhile, Sarona Market, to the north, is a high-end culinary centre with a modern food market vibe, similar to St. Lawrence Market in Toronto. Of course, when in Tel Aviv, one must visit the beautiful beaches. Stretching all the way down the city’s Mediterranean coast, enjoy the warm water, sports and beautiful sunsets. Along the beach, the city also offers a promenade, where you will find locals walking, running and biking. The promenade is also home to Tel Aviv’s annual Pride parade. Walk south through the picturesque streets of Neve Tzedek, which connect the new city to the old city of Jaffa. Known for its diversity and cultural dynamism, Jaffa is filled with shops, restaurants and history. The Jaffa clock tower, near the local flea market, is often used as a starting point for tours. This is where cafés serve hummus with fresh pitas, and is a perfect place to grab breakfast. Located on a hill with a stunning view of the Tel Aviv skyline, the Old City of Jaffa is host to a beautiful green space, St. Peter’s Monastery and the Great Mosque. Winding your way down the cobblestone streets will lead to the Jaffa Port where biblical tales and historic episodes of modern history have unfolded. Take a stroll around the harbour and watch the fishermen on their colourful boats as you decide which of the seaside restaurants you’ll pick for dinner. Jerusalem is a city of contrasts. While the Old City is full of ancient history, the modern city is a vibrant metropolis, with all the traits of a major Western capital. As Israel’s capital, Jerusalem is home to the Knesset (Israel’s parliament), the Supreme Court and other national landmarks, including Yad VaShem, The World Holocaust Remembrance Centre, and the national cemetery on Mount Herzl. Jerusalem’s crown jewel is its Old City, a UNESCO World Heritage site with four distinct quarters, Muslim, Christian, Jewish and Armenian, each more than 1,000 years old. Enter through the Jaffa Gate to visit the Tower of David, overlooking an archeological museum that contains ancient ruins dating back nearly 3,000 years. 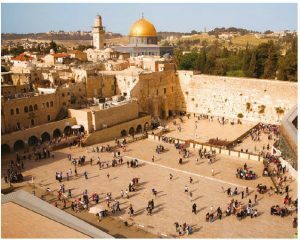 From there, cross the Jewish quarter to visit the holiest site in Judaism, the Western Wall. A remnant of the Second Temple, it serves as a pilgrimage destination for Jews from around the world and it is a custom to place a note in the wall. While here, don’t forget to check out the wall tunnels, a breathtaking underground site, dating back to the 1st Century. Just beyond the Western Wall, you will find the third holiest site in Islam, Al-Aqsa Mosque on the Temple Mount. Today, the Temple Mount, the ancient site of the Jewish Temple, is also home to the Dome of the Rock. Neighbouring the Temple Mount is the Church of the Holy Sepulchre, which contains Christianity’s two holiest sites. Built almost 1,700 years ago, the church is the site where Jesus was crucified, and is where he is said to have been buried and resurrected. The cultural and social hub for Jerusalemites is Machane Yehuda, the Shuk. During the day, the bustling marketplace, with more than 200 vendors, serves as a centre for purchasing spices, sweets, fresh produce, Judaica, street food and more. It is the ideal place to gain an appreciation of the vibes of modern Jerusalem. At night, drinks replace spices, and the market becomes a dynamic scene of nightlife, with restaurants, bars and live music. One of my favourite sites in Jerusalem is the Biblical Zoo and Aquarium. With almost a million visitors last year, it is a unique place that conserves local biodiversity, and where visitors of all religions and ethnicities can enjoy the rich zoological variety. Founded 78 years ago by Professor Aharon Shulov, it is renowned for its success rate in breeding endangered species. To me, Israel is a country of epic contrast, where every step you take tells a story of its present and its past. It is a country of great diversity in its people and topography, sounds and cuisines, cultures and traditions. It is a country home to faith itself, where holy sites for Jews, Christians and Muslims are scattered across a sacred land. It is a country of immense beauty visited by a record-breaking four million tourists in 2018. Won’t you join them this year? To start planning your trip, visit www.goisrael.il and follow us on Twitter @IsraelinCanada to learn more.